Misheard Lyrics -> Song -> D -> Do They Know It's Christmas? Misheard lyrics (also called mondegreens) occur when people misunderstand the lyrics in a song. These are NOT intentional rephrasing of lyrics, which is called parody. 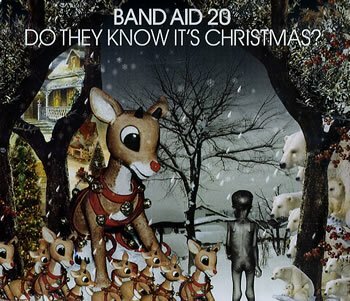 This page contains all the misheard lyrics for Do They Know It's Christmas? that have been submitted to this site and the old collection from inthe80s started in 1996. For more information about the misheard lyrics available on this site, please read our FAQ. We can spread a smile at George. We can spread a smile of joy. At Christmas time, we let in light and we banish hate. At Christmas time, we let in light and we banish shade. Raise a glass for everyone. The original is better than the remake, and I'm not biased because Robbie Williams is on the remake. Don't they know it's Christmas time? Don't you know it's Christmas after all? Let's us know it's Christmas time. Let them know it's Christmas time. The greatest gift they'll get this year is rice. Yes there's snow, it's Christmas time. 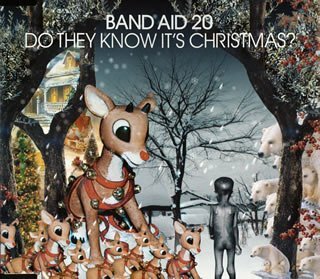 Band Aid's, "Do They Know It's Christmas"
Last Misheard Lyrics File: Do The Evolution Next Misheard Lyrics File: Do They Owe Us A Living?